No one should see this. : I'm not old enough to have a kindergartner. I have not yet succeeded in convincing Shannon. I tried convincing her to have a backwards birthday or go bact to being a baby, and she wasn't having it. 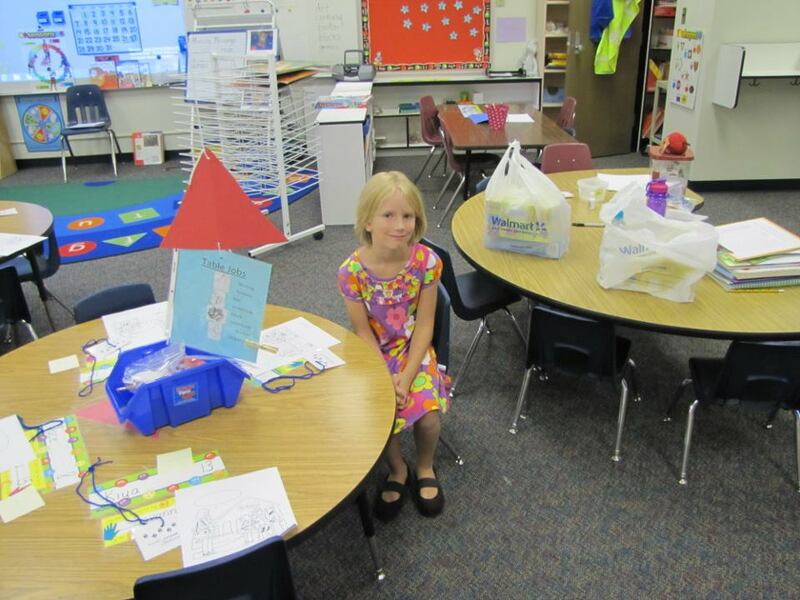 this is her at her table in her spot in her classroom. I'm not okay with it. I got up early yesterday morning and got her dressed and fed. We went to the school, and found her classroom. it involved a little wandering around, I had no idea where I was going. Once we found it, her teacher came in. I was really impressed, when her teacher asked her what her name was, she actually answered her. we unloaded her supplies and I took some pictures. I've been worried for weeks that there would be hysterics when I tried to leave her at the school, so I hoped that by going early Shannon would have time to get settled in and be okay. We went outside and she played on the playground for a while. I just stood there in the cluster of other parents, watching. when the bell rang, Shannon came up, grabbed ther wrong backpack- there was another girl there with a Hello Kitty backpack- put that one down, found hers and got in line. it was kind of hilarious looking at her next to the other kids. She's at least a sold four inches taller than the next tallest one. So I managed to make my way through the other parents, gave Shannon a hug and a kiss and told her I'd be back to pick her up when she got done. She said ok, and followed the line into the building. and then I had to rush to the car so I didn't embarass myself by bursting into tears. When I picked her up, she was super excited, and kept telling me all day that she missed school and wanted to go back. so that it. I have a kindergartner.